Do you wish to make the best use of the self-paced technology-enabled learning format? Are you looking for ways to harness the full potential of e-learning? Would you like to ensure high levels of learner engagement? Well, then you need to go in for microlearning modules. Microlearning refers to the delivery of e-learning content in the form of “information morsels”. The content is divided into several 5 to 10 minute online learning modules, each addressing a learning objective comprehensively. It is a best practice to enable the learner access the modules in the order of his choice. When the learner finishes all the modules, he would have completed the entire learning content. Microlearning is very useful to deliver a wide variety of corporate training programs such as product training, software training, compliance training, etc. in an effective manner. How can microlearning help provide good corporate training? Most millennial learners have very short attention spans. A study conducted by Microsoft revealed the average attention span of Gen-Y learners is just eight seconds, shorter than that of a goldfish which can remain focused for nine seconds. The limited attention spans of these young learners are compelling companies to use bite-sized e-learning modules for training. Mobile learning is growing by leaps and bounds. According to MarketsandMarkets, the mobile learning market is likely to touch the $37.60 billion mark by 2020, up from $7.98 billion in 2015, recording a compound annual growth rate of 36.3%. As corporate training gets increasingly mobile, a number of companies are going in for microlearning solutions. This is because short online learning modules can be accessed conveniently on Smartphones and tablet PCs. The ability of the human brain to process information is limited. In his best-selling book, Understanding Occupational & Organizational Psychology, Lynne Millward advocates presenting content in pieces to ensure good comprehension. Bite-sized modules are ideally suited for delivering corporate training, as they don’t overwhelm your staff members. Microlearning goes a long way in personalizing corporate training. When the learning content is divided into several short modules, your people can access the needed modules and skip the rest. A pharmaceutical firm has divided its compliance training content into several modules covering various aspects such as the code of conduct, Good Manufacturing Practices (GMPs), norms pertaining to clinical trials, off-label marketing, etc. All employees are required to go through the module covering the code of conduct, whereas the module on GMPs is assigned only to the staff of production and quality control departments. Likewise, the module on the norms pertaining to clinical trials is assigned only to people who conduct them, while the module on off-label marketing is assigned only to medical reps.
Corporate training budgets are shrinking and the demand for the quick rollout of e-learning courses is on the rise. These needs can be well met through microlearning modules because it takes less time and money to develop these modules compared to lengthy e-learning courses. 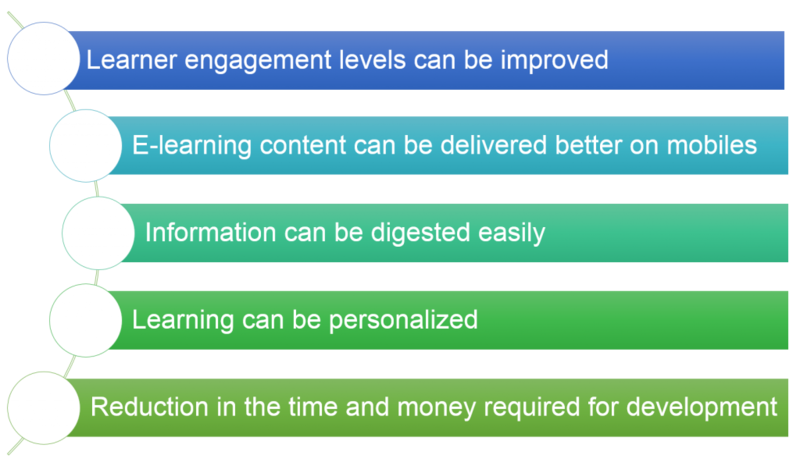 Microlearning refers to the delivery of e-learning content in the form of “information nuggets” of 5 to 10 minutes, each covering a learning objective. These short modules are ideal to deliver corporate training for the following reasons. How do you use microlearning to train your people? We’d love to know.